Craftster Community > KNITTING > Knitting: Discussion and Questions > Mystery Yarn in pretty melon sorbet shades. But what IS it??? Mystery Yarn in pretty melon sorbet shades. But what IS it??? I have tried various search engines, to no avail. Is there any Craftster's out there able to assist or offer advice even? What the heck is this yarn??? OK. From the start. I have come into possesion of this pretty yarn, but I don't know what the fibre content is. All I was told was that it is Chinese, but as I don't read Chinese I can't even confirm that much. I thought of doing a burn test, but I don't think it will help much. what I can tell from the label is that it is 70% fibre A, and 30% fibre B. So, chances are one of those is synthetic and the other is not. So a burn test won't tell me much at all. Does that sound right. Here are some close ups showing the rest of the ball band. If I'm really lucky someone here will be able to read this. But if anyone can give me any advice on other methods of identification, I'd appreciate it very much. So far I have tried 'Softto', 'Suofu Te' and 'Suofute' in search engines. No luck there. I also tried two different sets of numbers I found on there, no luck. I think both were references to industry standards. I also tried translating these in Babel Fish, no luck there either. Re: Mystery Yarn in pretty melon sorbet shades. But what IS it??? I have no idea what the Chinese says (if it is Chinese! 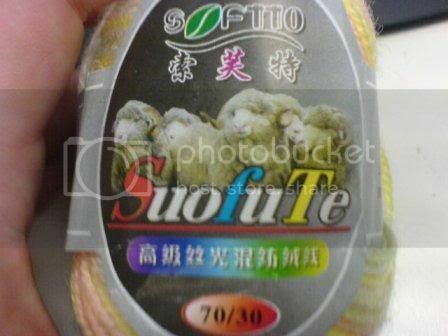 ), but I'd be willing to bet that SuofTe is Chinglish (Engrish) for soft. I'm not sure it's a brand name! Hopefully someone reads Chinese here and can help you. that is a tough challenge. maybe you could do a swatch of it and throw it in with your laundry to see if it felts. there's sheep on the picture so maybe it's partially wool? no matter what it's made of, it's very cute. I don't think it feels totally acrylic. It has no 'itch' feel either. So I am convinced it is a blend - of some sort. I agree I ought to try to felt a swatch. I'll give it a go on the weekend. The downside to that is that I had hoped this stuff could end up as socks, if it did indeed turn out to be 70% wool and 30% synthetic. I fear I am going to have to try to look at it under a microscope or something. Guess it's not much help..
you could email them and ask about the yarn..
Yeah I found the site earlier. I figured it is a completely different company. There is not a mention at all of anything that isn't cosmetics. 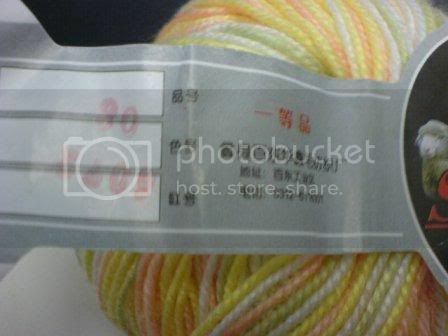 I don't know Chinese, but the first line on the tag can be read as "wool" in Japanese; literally, the first character is "sheep" and the second one is "hair." Do you think the picture if the rather handsome Merino sheep on the ball band is a marketing ploy or an indication of the fibre content? Have you tried a burn test? Snip a little off and burn it with a match - if it has a high wool content it will smell like burning hair and produce a powdery ash, if it has a high synthetic content it will have a chemical-ly burning smell and produce a more gooey ash - think melted plastic. In the first picture, the words above the 70/30 say "high grade..." and the third word I think is silk, and the rest of the words are quite blurry. Could you provide another pic? 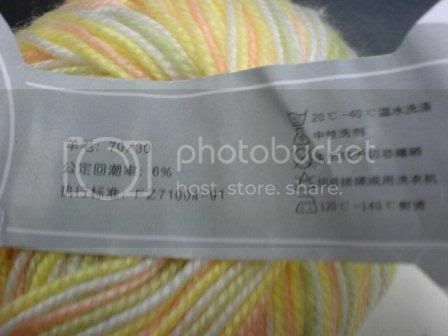 In the second picture, where it says (sheep) Wool: 70/30 so it's probably 70% wool and 30% something else. I'm not sure if the wool is merino or not. In the rest of the second picture, there are the product code and care instructions: the firstcare instruction is wash in warm water 20 - 40 degrees, for example. The third picture doesn't do much. It says that it's a first grade item and the place of production. Sorry, what I said hasn't added much to the info that you already know! If you could take another pic of the words on the front of the band, that'd be helpful. I'll also ask my mom about this later today; she has more experience with Chinese yarn than I do.